The world of cars is accident-prone; many people get hurt and cars get damaged. Sometimes, people do it on purpose! Accountability and safety are important while driving and while parked, and a lack of accountability for that one car that left a giant scratch on your car can create a huge expense for you. Cars that come a little too close for comfort on the highway will have their information recorded using computer vision. Our project senses cars that come within a certain radius of your car. Once that happens, the camera snaps a photo of the offender and is able to determine the license plate number, the car make/model, and the color. 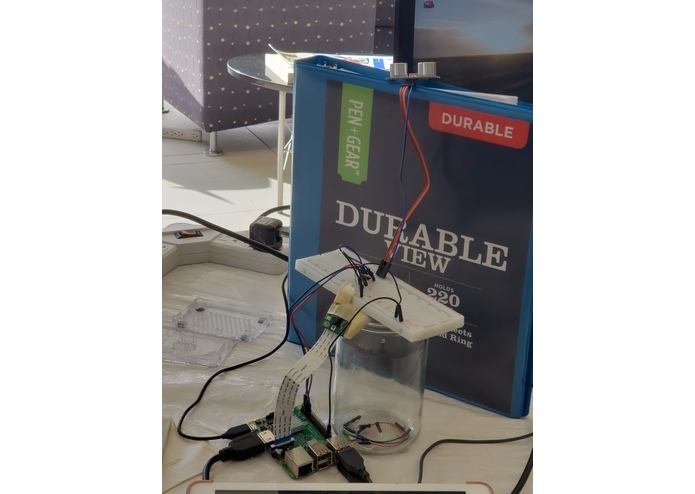 For hardware, we used a Raspberry PI linked to a camera module, an ultrasonic sensor, and a breadboard to connect the ultrasonic sensor to the Raspberry PI. We used the OpenALPR library to analyze the images taken. Compiling OpenCV on the Raspberry PI took a very long time, and failed in the middle once, causing us to waste hours. We originally set up a web application to send the data to, but we faced issues receiving the data sent from the Raspberry PI. We are proud that we ended with a working prototype that was very accurate. We learned about OpenCV and computer vision, the Raspberry PI, and how hardware and circuits worked. Clean up the code and add practicality features to make this project not just an open source prototype, but an open source solution.